Gordon Murray is one of the legendary past pupils of Glenwood Preparatory School. He lived at 18 Crart Avenue, about 800m from the school, arriving in Grade 4 in 1955 and leaving at the end of Grade 8, in 1959. Thereafter, he moved on to Glenwood High School. Gordon enjoyed designing and building soapbox carts, driving them along Bulwer Road and the adjacent narrow Glenwood suburb lanes. Gordon, his brother Terry and their friends, enjoyed growing up in the Glenwood area in the late fifties and early sixties and the love for music and racing became Gordon’s great passions. Gordon married Stella Gane and they settled in the United Kingdom, where he secured his first major Formula 1 Car design position at Brabham. Gordon’s creative career literally took off and international success was achieved at Brabham, McLaren and Gordon Murray Designs. Gordon’s achievements as a designer included 2 World Constructors Formula 1 Championships, 5 World Formula 1 Championships and 50 Grand Prix wins. 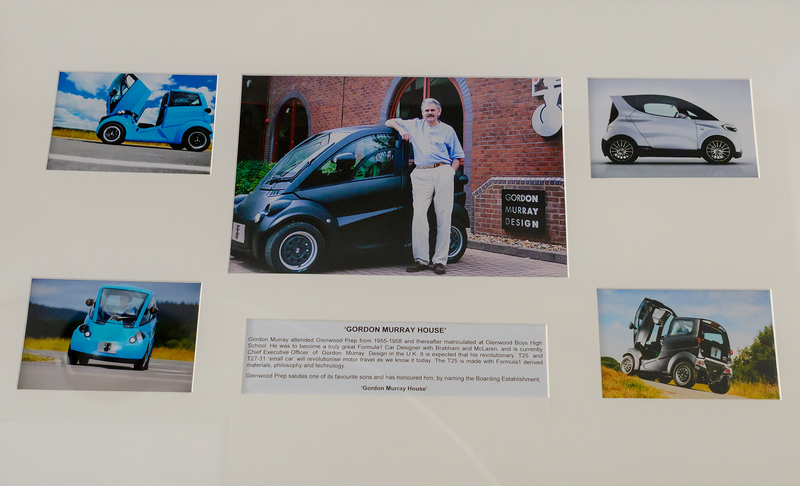 Today, as Chief Executive of Gordon Murray Designs in the U.K, Gordon has a handpicked team of 29 experts who are vastly experienced in their specific fields of motoring. They are currently designing the T25 – 31 car with dimensions of 2.50m length, 1.30m width, 1.60m height – a vehicle made from recycled materials, that will be smaller than a Smart Car but with more interior space. This car is expected to revolutionise vehicle transport as it is known today. Gordon Murray has always maintained close links with his Primary and High Schools and Glenwood Prep has decided to recognise his achievements, by naming the New Boarding Establishment (2015) after him. The Gordon Murray Boarding Establishment will initially be able to accommodate 12 boys with the potential to increase the numbers to a maximum of 50 by 2017. The vision is to establish a ‘home away from home’ living environment, with a conscientious effort being made to provide the boys with a much homelier environment to the traditional institutional atmosphere of a boarding establishment. The Gordon Murray House is situated next to the school and will be incorporated into Glenwood Preparatory’s boundaries, thus providing a safe and stimulating environment for the boarders. Emphasis will be placed on excellent academic support, which will complement the high standard of education offered by the school. In addition, the boys will have the opportunity of excelling in Glenwood Prep’s outstanding sporting and cultural programmes. Naturally, an appropriate Value System, incorporating a high standard of politeness and good manners, will be emphasised, together with the friendly spirit of camaraderie that this close knit group of boys will experience. Gordon Murray House will no doubt provide the boys from Grade 4 to 7 with a wonderful opportunity to develop their potential, and so fully prepare them for the natural progression to Glenwood Boys’ High (situated ± 200m down the road).